The four kibbutzim (communal settlements) of Gush Etzion are associated with several sad and glorious chapters in the history of modern Israel, and with a massacre carried out by Arab Palestinians. The Etzion Bloc, or Gush Etzion as it is called in Hebrew, is located on the main road from the south to Jerusalem, northwest of Hebron. The Etzion bloc was settled and resettled three times, on land purchased by the Jews, beginning in 1927. Each time, residents were forced to abandon their homes in the face of Arab violence. The final saga of the Etzion bloc included two separate massacres and a prolonged and stubborn defense against hopeless odds. The bloc was finally overrun by soldiers of the British armed and officered Jordan Legion, who were responsible for the final massacre of surrendered defenders, a war crime. The first settlement in this area was called Migdal Eder, built on land purchased from local Arabs by the Zichron David Company. It was founded in 1927. The pioneers included orthodox Yemenite Jews. During the Arab riots of 1929, Migdal Eder settlers were evacuated to the Russian Orthodox monastery and thence to the Arab village of Beit Umar, from which they were evacuated to Jerusalem by British mandate police. The British made no attempt to guard the settlement or safeguard property, and it was completely destroyed. Additional lands were purchased by the El Hahar Company, which founded a kibbutz called Kfar Etzion in 1934. Like Migdal Edder, Kfar Etzion was abandoned during the Arab violence of 1936-1939 and destroyed by the Palestinian Arabs. The only problem is that they are smack in the heart of Arab territory. So what sense of security can there be? UN General Assembly Resolution 181 of November 29, 1947 divided the land between Arab and Jewish states. Gush Etzion, like many other Jewish communities, was in the Arab sector. Arabs rejected the resolution. The leader of the Palestinian community was Grand Mufti Hajj Amin El Husseini, Grand Mufti of Jerusalem, who had previously instigated a pro-Nazi coup in Iraq and later organized SS units for the Nazis in Yugoslavia. The Arab league set up "salvation" (In English - The Arab Liberation Army) army, with the declared goal of liberating Palestine and "ridding that country of its Jews." The Arabs of Palestine responded to the partition resolution with riots, massacres and a blockade of Jerusalem and outlying Jewish settlement areas, including Gush Etzion. Husseini and the Arab Higher Committee started their own armed group, led chiefly by Husseini's cousin, Abdul Khadr El-Husseini, an able soldier who was killed in April 1948. Despite the military impossibility of defending isolated Jewish villages and kibbutzim like Gush Etzion, David Ben-Gurion decided that no area would be evacuated without a fight, as evacuation would demoralize the Jewish community. This decision was in retrospect seen as a mistake, because the Haganah and Palmach underground "armies" did not have the capability of defending these areas. The British, still in Palestine, looked on and did virtually nothing as the sides clashed. Gush Etzion had strategic significance. It was located on the road used by the Arab irregulars and the Transjordanian Legion to transport weapons and supplies to Jerusalem. The Palmach sent Danny Mas with a platoon of reinforcements to supervise fortifications and defense. The total fighting force in Gush Etzion consisted, by the spring of 1948, of 535 men and women, including 215 men and 100 women of the kibbutzim and 220 fighters sent by the Haganah. The blockade - The chief problem during most of the fighting was not manpower but ammunition and weapons. Gush Etzion was cut off from Jerusalem and the rest of the Jewish community because Arab villagers organized "faza" attacks to block the roads. The Jews attempted to bring supplies to the bloc in convoys of "armored" cars as well as by air. These vehicles were for the most part closed pickup trucks with a thin overlay of tin sheeting on wood ("sandwich") added in makeshift workshops. 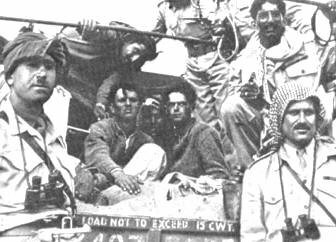 The Convoy of 10 - The initial convoys to the bloc used open pickup trucks, since the British insisted that armored vehicles would arouse the ire of the Arabs. They were accompanied by official mandate police "monitors" ("notrim") in uniform. The convoy of 10 was the first failure of such convoys. Its four vehicles were ambushed on the main road north of King Solomon's pools on December 11, 1947. Actually, there were 18 people in the convoy. Ten of its members were killed, four injured and only four escaped unhurt. On December 14 an additional person was killed in another attack on a convoy, and the Haganah decided that from now on it would use armored "sandwich" vehicles in the convoys. Uzi Narkiss becomes commander - On January 8,1948, Danny Mas was returned to Jerusalem and a new command. Uzi Narkiss became the new Haganah commander. Danny Mas was well loved by the people of Etzion block. His quiet self confidence and competence became the model for the legend of the Israeli soldier of 1948. Ambush of January 13, 1948 - An additional ambush was carried out by the Arabs against a small convoy returning to Jerusalem. Two people were killed, one of them a medic coming to the aid of a wounded man. 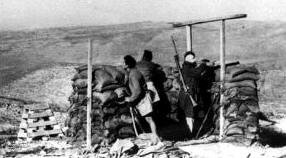 First Attack of January 14 - About 600 Arab irregulars led by Abdul Khader El-Husseini attacked the Etzion Bloc. They consisted of cadets of a training course he was giving in Surif and villagers gathered from Hebron, Bethlehem and surrounding villages in the faza levee. In addition to the 600 attackers, hundreds of Arab youth gave logistics aid. The attack was discovered in advance by accident and repulsed by effective defense. Three more Gush Etzion defenders were killed. The Hagannah had acquired a number of antiquated civilian aircraft, chiefly Piper cubs and Austers. These were used to supply the bloc by parachuted airdrops in January. it was then decided to prepare an air strip which was in service from February 1948. - The first small plane landed on an airstrip which had been prepared near Kfar Etzion. At the end of February, residents rejected a proposal to evacuate married men and allow them to be reunited with their families. Under orders from the Haganah, the Gush continued to interfere with Arab transport, including supply of the Legion, by firing on the road to Jerusalem. Yitzhak Levy, the head of Haganah intelligence in Jerusalem cautioned that these attacks would draw a severe reaction, however, David Shaaltiel, who commanded the Haganah in Jerusalem, was adamant about the necessity to stop the supply of the Legion and the Arab irregulars. The Legion was expected to attack Jerusalem as soon as the British left on May 15. The irregulars were attaching. The British continued to supply the Legion through this road, and its commanders, including the British commander, Glubb Pasha, ordered two attacks, even before the end of the mandate, while British were still nominally responsible for order in Palestine. The first, accompanied by a British armored unit according to some sources, was repulsed on May 4. The second and final attack began on May 12, 1948. Legion soldiers of the 12th company and a company made up of units of the fifth battalion were accompanied by thousands of Arab irregulars. The irregulars were anxious to avenge the Jewish attack on Deir Yassin (April 9) in which over a hundred Arab civilians were killed. They had already carried out a bloody massacre on a convoy of doctors and nurses going to the Hadassah hospital, killing 80. It did not take great foresight to understand that they would commit a similar massacre in Kfar Etzion. The attackers had about 20 armored vehicles, including six proper armored cars with two pound cannon, half tracks and several "sandwich" vehicles captured at Nebi Daniel. They were supported by a battery of three inch mortars. The defenders had one three inch mortar, two PIATs (PIAT was a British designed anti-tank weapon for infantry that saw service from 1943 to the end of the Korean war) and one anti-tank gun. Given the fate of the defenders of Kfar Etzion, the defenders of the remaining kibbutzim decided not to surrender without the presence of the International Red Cross. This was arranged from Jerusalem. The survivors of Gush Etzion were taken to prisoner of war camps in Jordan for the duration of the conflict, notwithstanding the fact that Jordan had not yet officially entered the war. Gush Etzion and its defenders, particularly Danny Mas, became part of the folklore of the nascent state. The account of the mutilated bodies of the convoy of 35 ("Lamed Heh") became known despite the suppression of photographs. Many of the Jews of Palestine believed that the Arabs had set the rules of the game for this war. The story that the 35 had been betrayed by an Arab shepherd whom they met on they way and had spared, as well as the massive participation of Arab civilians in the massacre of the convoy, reinforced the impression among many in this war that no rules of war would be followed, that there were no civilians and no enemy person should be spared for any reason. The fate of the convoy of thirty-five as well as the massacre of surrendered soldiers by the Arab forces, along with other massacres, stamped-in the conviction that the Arabs of Palestine and their allies would conduct a war of extermination and ethnic cleansing in Palestine. Those Jews who were not killed would be evacuated. No Jews would be allowed to live on territory conquered by Arabs. The Etzion bloc was looted thoroughly by Arab villagers and irregular troops. A Jordanian army camp was set up there and Deheisheh refugee camp was built on part of the land, which belongs to the Jewish Agency. After Israel conquered the West Bank in 1967, a community including some of the the original setters of 1948 returned to establish settlements there. * Most English histories of Gush Etzion follow the narrative of Dominique La Pierre and Larry Collins in O Jerusalem. This account is based on several versions, chiefly the one given in Itzhak Levi, Jerusalem in the War of Independence, ( "Tisha Kabin" ("9 Measures" - Hebrew), Ma'arachot IDF publishing house-Ministry of Defense, 1987 and similar accounts based on testimony of survivors. The tally of 50 dead and four survivors given in O Jerusalem is probably incorrect. See here for details about the Arab-Israeli conflict and History of Israel and Palestine. This work is copyright by the author. Please link to this page from your Web site. You may print out this article for private use or send it by email with this notice, giving credit to Israel and Zionism Information and History Center http://www.Zionism-Israel.com. This work or any part of it may not be reproduced for commercial use without express permission of the author.